The material is a layer of synthetic fabric (polyester) with 2-sided coating of polyvinyl chloride layers, interconnected by special adhesive composition. 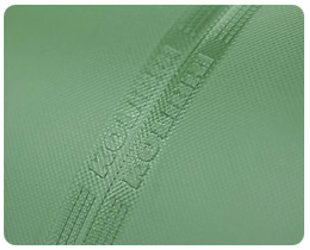 The dense weave of the base layer material provides high strength and resistance to cuts and punctures. The layers of polyvinyl chloride provide air impermeability of the material. Plasticizing agents make an elastic material, which is important for folding and unfolding the boat, especially at low temperatures. The material is resistant to ultraviolet radiation, salt water, fuels and oils. It retains its properties in the temperature range from -30 В° C to 60 В° C.
Manufacturer: One of the leading companies in the world market for the production of high quality materials for inflatable boats. 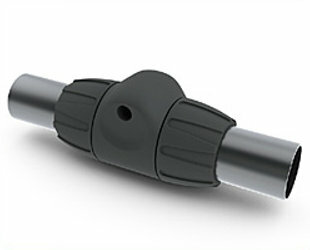 The main components are welded to the connection settings of high-frequency current, with the application of a logo Kolibri. This technology enables the bond strength of 20 - 30% and above. Computer-controlled process is devoid of irregularities inevitably inherent bonding. This is a two layer fabric tight, topped with stable PVC, located at a distance of 60-80 mm from the set of strings (from 2 to 5 threads on each cm2). 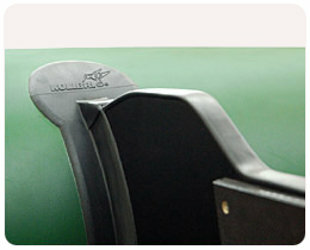 It is used for the manufacture of inflatable bottom. 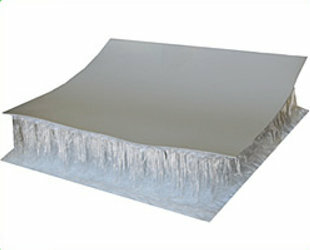 Being airtight, the material is inflated with excess elastic and durable. 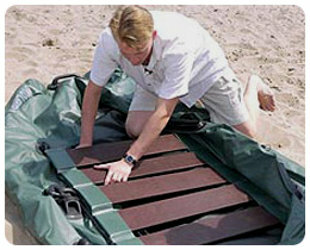 Advantages of inflatable bottom "Kolibri" - the small size and weight in transport condition, quick assembly. You only need to pump up the bottom of the boat a special high-pressure pump, as nominal pressure on the inflatable bottom is 4-5 times greater than on an inflatable balloon. For the manufacture of cylinder joints Boats "Kolibri" we are using the technology of hot air welding. This technology provides high-quality appearance of strong flat seams for one cycle, while ensuring fast and uniform heating of the materials to be welded over the entire thickness in the field of welding. 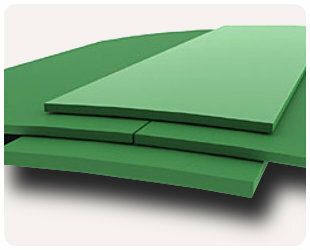 The result is a heavyduty, sealed seams, resistant to excessive loads and temperature extremes. 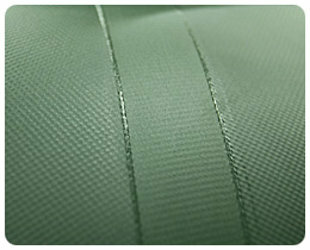 Seams are performed "joint-to-joint" with additional reinforcement of external and internal sides. 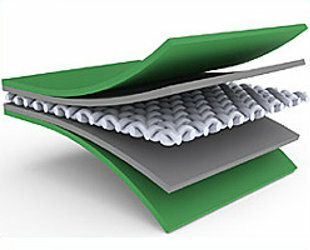 To glue seams they use adhesive with polyuretane base, which consists of 2 components resistant to ultraviolet. It gives an effect of cold welding when contacts with material of adherent surfaces. Boat pontoons have partitions, dividing them into pressurized chambers. 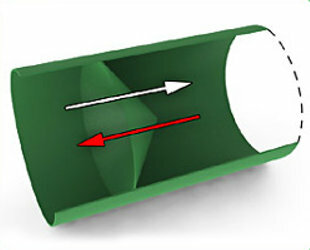 Partitions are made in the form of cones to stabilize pressure in all chambers of inflatable pontoon. Rowboats Kolibri have 2 chambers, motor boats have 3 and more. In this way boat keeps positive buoyancy with damage of one of chambers. 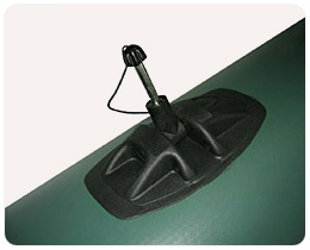 Boat rowlock has been proved among fans of inflatable boats. Model 2006 is plug-contact rowlock. A new model of rowlock is experience and work of the best technologists of "Kolibri" firm. Design of a rowlock provides smooth and easy course of a boat with minimal expenses of oarsman's forces, and high-quality materials guarantee long-term running. The new development of Kolibri - adjustable clutch paddles. Clutch is made of durable plastic, and allows you to adjust the length of the paddle and blade angle of attack. Boat removable deck is made from waterproof sea plywood. To make assembly and disassembly easy, sections of flooring are joined by aluminium profile, which adds rigidity to the deck. Sole-book - is a new version of the bilge flooring of motorboats Kolibri. Bilge flooring are placed along the length of the boat consists of 3 or 4 sections specially impregnated plywood, connected to each other tapes of PVC material. Bilge flooring greatly increases the rigidity of the floor and improves driving performance of the boat. Aluminum floor is slip a notch Kolibri constituent elements that are drawn from the bands of the hollow section, fitted with internal cell walls. This form allows you to significantly increase the rigidity of the structure. The service life of aluminum flooring is practically unlimited. Developed by leading experts of the transom mounting base Kolibri can support the weight of the engine, as well as the efficient allocation of enormous forces generated by the motor, vibration and stress. 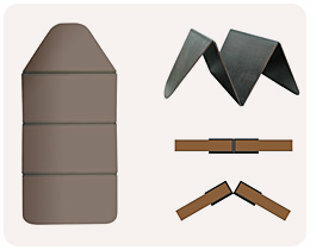 Transom is made of waterproof plywood, the top of the transom is protected by special PVC-profile. 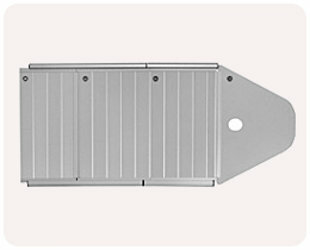 Plastic transom is made of modern technology, has the maximum protection from water, the top of the transom is protected by special PVC-profile. 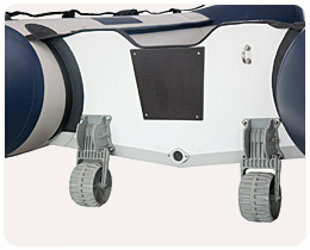 Transom wheels provide for easy and quick descent and ascent curb inflatable boat Kolibri. 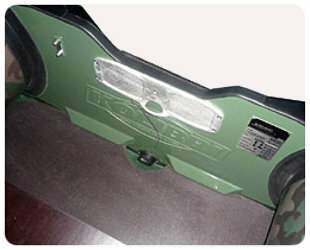 Transom wheels are made of glass-filled nylon, which ensures their high durability. The wheels are mounted on a stationary wooden, fiberglass and aluminum transom. Payload package - 140 kg.